Steffi Graf's third consecutive title in 1993, her fifth Wimbledon win in all, was overshadowed by her opponent. Jana Novotna had victory in her grasp but conspired to lose from a double break of serve up in the third set. Graf looked down and out as Novotna went for broke on a second serve for a 5-1 lead, but nerves got the better of her, she missed and Graf had a sniff. 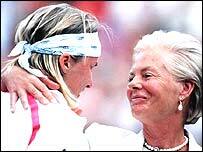 When the German secured the win Novotna cried her eyes out on the Duchess of Kent's shoulder at the presentation. It was an enduring image in the history of the tournament and completely understandable. At 5-1 down in the third Graf had taken only two of the previous 10 games. On winning she reflected: "With the way Jana was playing and the way I was playing, yes, I'd kind of lost it. I didn't give up but I didn't have a very positive feeling"
Novotna already had a reputation as something of a choker, but it is a testament to Graf's ruthless will to win that she could come back. When Graf finally won, she gave an understandable yelp for joy. But by the time she reached the net to shake hands and had seen the look on Novotna's face, all she could do was ask if she was alright. The Duchess, who had met Novotna several times before, said: "Don't worry Jana. I know you can do it." Then the tears started to flow. But she was right. After losing the final again, in 1997 to Martina Hingis, it was third time lucky for the Czech when she beat Nathalie Tauziat in 1998.